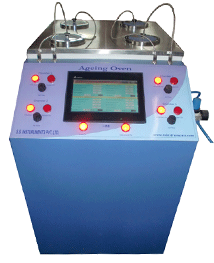 Skewing / Slicing Machine - S.S. Instruments Pvt. Ltd. The machine is used to reduce the thickness of XLPe sheet to prepare final sample sheet of upto 0.8 mm thickness for testing. Different test procedures require different sample thickness to be tested. If the sample has to taken out of cable sheathing / the thickness of the sheathing may have to be reduced to achieve the desired thickness. The Slicing / Skewing machine applies the principle of push and cut by using two rollers moving in different direction with a very sharp blade at the other side of the rollers. The distance between the upper roller and the blade determine the final sample thickness. The distance between the upper roller and the blade can be adjusted, for different types of samples. The lower roller is mounted on a spring set, which adjusts according to the sample thickness. 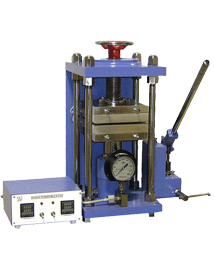 This gives the machine flexibility to cut various different thickness of samples and provide final strips of sample between 0.8 mm to 2 mm as per requirement. The slicing machine is capable of slicing samples from 4 mm to 10 mm and give a final sliced strip of 0.8mm to 2 mm as per requirement.